There has never been a bigger selection of paints to choose from, but don’t be intimidated! Choose the right paint for every job with this handy guide. Just How Much Gloss Do I Want? Matte/Flat paint has no sheen and a rougher texture than other paints. It is ideal for hiding imperfections on your walls and ceilings because it absorbs, rather than reflects, light. The trade-off is that lower end mattes won’t wipe clean quite as well as higher gloss paints and colors tend to look less vivid in this finish. Eggshell is a happy medium between satin and matte. It has a low-sheen finish, but a smoother surface for easier cleaning. Satin finish paint takes the sheen up a level – which gives a warm glow to a room. It cleans up well, but the more reflective surface will show all flaws. Semi-Gloss is highly cleanable, wears well in high-traffic areas and is a great choice for Hallways, Kitchens, Bathrooms, Cabinets & Trim. Gloss paint is great for high-drama reflective finishes on trim and cabinets. It’s also easy to clean and resists stains, fingerprints and dirt. Gloss and Semi-Gloss can both do a great job on trim, so it’s really a matter of how much shine you like to see. Do I Want Special Bathroom Paint? This is one room where you can really benefit from special paint. Until recently, gloss paint was your only option for repelling moisture and sometimes it would still mildew. 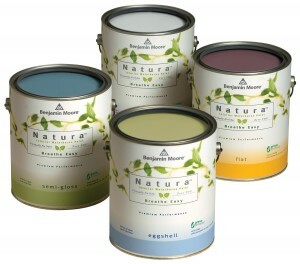 Now there are special bathroom paints which repel mildew, wipe clean and even offer matte finishes! When you see a paint label that says low VOCs, why should you care? VOCs are Volatile Organic Compunds that evaporate into the air gradually after you paint. These chemicals aren’t good for the environment and they aren’t good for you, either. There are many potential health problems associated with VOCs. This is especially important to consider during colder weather, when you can’t always just leave your windows open to air out a room after painting. Is Premium Paint Worth It? Premium paint doesn’t just have a fancier label. It offers stronger pigments, superior coverage and better cleanability. For high traffic areas, that can be a great investment. If you’re covering up dark paint, Benjamin Moore promises you’ll never need more than 2 coats for full coverage! This can save you time & money since you’ll need less paint. Water Stains or Wood Knots? Killz Primer will save the day. Water stains and the resins from pine knots will keep leaching through the paint no matter how coats you use. It’s like a curse! Prime first with Killz and the curse is lifted! Chalkboard paints can make any surface a washable chalkboard for your reminders or your child’s artwork, and they don’t even need to be black. You can buy it in any color from Benjamin Moore! Sand finish paints offer a subtle textured finish (far smoother than stucco) and great coverage on flawed walls. Glazes offer a tinted, semi-sheer finish that goes over regular paint for special, artistic effects. They come in both regular colors and metallic varieties, so you can get creative with your paint! Jackie Says . . .